Backcountry hiking, sailing, or exploring remote areas can be freeing and exhilarating, but escaping contact with civilization doesn’t always work out as planned. Even people who decide to live off the grid often want a method of communicating with authorities or family in the event of an emergency. When you’re heading out beyond cell phone range — whether you’ll be on land, water, or ice — a satellite phone can be a two-way lifeline for emergency calls. Satellite phones let you make and take calls in the field. Sat phones use one of four networks of satellites — only three of which serve the United States. Many models also send and receive text and email messages. Sat phones often include GPS and tracking functions, to use as a backup GPS or send SOS messages. Data connections come standard with most satellite phones, but don’t think you’ll use them to post photos on Instagram or browse the internet. Satellite phone data connections currently max out at 9.6 kbps. The options from the various networks include marine, aviation, and automotive packages, special antennae, enhanced internet-quality connectivity devices (at equally-enhanced equipment and service costs), and more. We focused on the basic equipment. Satellite phones and service plans aren’t cheap, although they’re less expensive today than they were 10 years ago. You’ll want to consider your needs and where you’ll be traveling carefully before buying or signing up for anything. The first step is to choose a network. Satellite network coverage, reliability, voice quality, and service costs vary widely. Once you’ve chosen a network (see below), you’ll then choose the phone and service plan which best fits your needs. 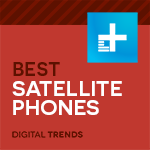 To help you select the right phone, we’ve assembled a list of the five best satellite phones available from the three satellite networks that service the U.S. and beyond. You’ll soon see that three of the five phones on our list are Iridium models. Iridium is the only satellite network with truly global service — including the two poles. Iridium is also the only network that currently offers more than one phone, although earlier models still function on their respective networks. Iridium’s top-of-the-line Extreme 9575 sat phone is impressively rugged, and both dust- and water-resistant. The 9575 has integrated GPS and an SOS button and lets you send and receive text messages and email, receive voicemail, and use it as a mobile hotspot. Maximum data speed is only 2.4 kbps, so short messages work best. If you need a rugged satellite phone to use absolutely everywhere, the Iridium Extreme 9575 is an easy choice. Talk time per battery charge is up to 4 hours. Take everything great we said about the Iridium Extreme 9575, toughen it up even more, and add push-to-talk communications. This is the phone for working teams or groups that move around the area. In exchange for almost $300 more than the standard 9575, the PTT model is a true dual-purpose handheld communications tool. Fortunately, PTT minutes are free and don’t count against your satellite service plan. The PTT’s larger battery powers just over six hours of talk time in phone mode and five hours in PTT mode. To enhance messaging in the field, the PTT button is extra rugged and the audio on this model is louder. If global sat phone connectivity is a must but you really don’t need heavy duty ruggedness or backup GPS duty and an SOS button, the Iridium 9555 is your best choice. The 9555 boasts four hours of talk time and 30 hours standby. Like the Extreme 9575, the 9555 has SMS and email capability. The 9555’s ruggedness is all most people need for truly global travel and use. Like the other Iridium phones, you can get a signal anywhere but if you have long calls — more than 15 minutes — the constant satellite movement may cause signal dropouts. You can talk while you walk with Iridium phones, which isn’t recommended with Inmarsat phones. All Iridium phones have the same service rates. The Iridium Monthly Wave Runner Plan, for example, provides 90 minutes a month for $100. Extra minutes cost $1.54 each. The Inmarsat IsatPhone 2 doesn’t work at the north or south poles but as long as you’re staying within the 70th north and south parallels, it won’t matter much. Inmarsat has only three satellites compared to Iridium’s 66, all located over the equator, so you might have to move away from obstructions to get a good signal. Once you have a signal, Inmarsat reliability is better than Iridium’s because if you stand still the signal maintains its strength. Reflecting its maritime heritage, the IsatPhone 2 is dust, shock, and splash resistant, and withstands 95 percent humidity. Battery life provides an impressive eight hours of talk time with 160 hours standby. The phone also has voicemail, SMS, and email messaging. A built-in GPS and emergency button sends a distress text to a pre-arranged number with your location. The IsatPhone 2’s price is lower than any of the Iridium phones but service plan costs are about the same. For example, Inmarsat’s IsatPhone Mid Plan costs $65 a month for 30 minutes, with extra minutes costing $1.05. If you’re traveling or staying within one of the Globalstar regional coverage areas — much, but not all of the world — the Globalstar GSP-1700 is the bargain lover’s satellite phone. The network’s service rates, while still much more than cellular service, seem extremely reasonable compared to the others. The Globalstar Orbit 200 minute plan provides 200 minutes for $100, with extra minutes for $0.99 each. If you need any more than 200 minutes a month, the Globalstar Orbit Unlimited Plan is $150 for unlimited talk time, which seems like a wonderful deal by comparison. Because Globalstar phones link with cell ground stations, they have far and away the clearest voice quality. With its 9.6 kbps data transfer speed, Globalstar is the speed demon of the lot but again that’s entirely relative. The GSP-1700 doesn’t send or receive SMS messages and there’s no GPS, but you can get your longitude and latitude directly from the phone while in talk mode. The Globalstar phone also has voicemail.